Psychologically this was probably one of the most challenging things to tackle, not least because it was around Easter time that I was faced with eating The Egg. 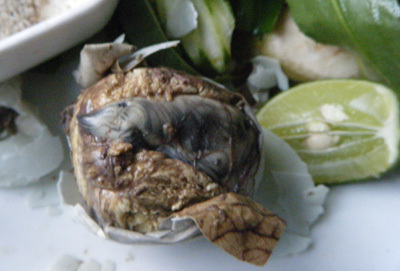 In Cambodia duck embryo (or fetus) is a popular snack found at lots of street vendors. At least that’s the general word. When you’re actually trying to find one it’s a different story, and I cycled through several non-fetal eggs before asking the people at my hotel if they could give me firm directions. In true Cambodian style they not only found me an egg they had it collected, cooked and served up on a little plate in an egg cup, which made the whole experience a great deal more appetising. 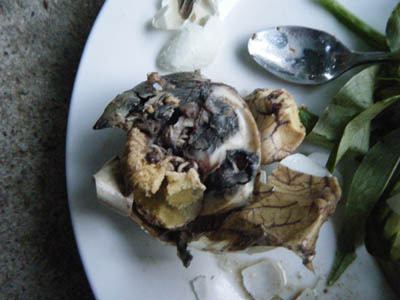 Cutting into the egg itself reveals a disconcertingly brown streaked innard, and when you open the shell proper you get a glimpse of the little birdy’s forming neck and beck, picked out in dark grey-blue against the wider backdrop. This is a little upsetting. The good news, however, is that the smell is quite appealing – like meaty egg yolk, and the taste is very much like it smells. Especially the brown exterior part. Digging into the neck/head/beak area was a slightly slimier texture, coupled with a crunch which could have been either bone or errant egg shell. If I was starving there would be plenty worse things than this to eat, and the flavour really was quite nice, but it is hard to get over the whole baby bird issue. Duck embryos are found all over Phnom Penh, but you’re best off having a local direct you (draw a picture if necessary) to avoid the various other forms of egg. Special thanks to the Blue Lime Hotel in Phnom Penh for finding the egg for me. 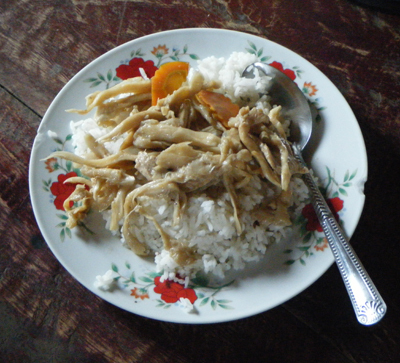 I’ve eaten a lot of bugs now, and in Cambodia in particular got quite used to seeing plates piled high with them. 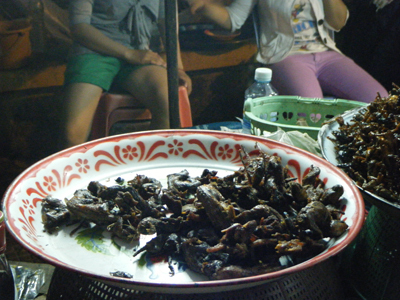 So it was a novel sight to come across big plates of fried mouse in Battambang, Cambodia. I say ‘mouse’ but in fact I suspect it was rat. I asked the nice lady behind the big plate of fried rodents what she was selling, and she wrinkled her nose as if in disgust at her own produce and said ‘that mouse’. I think she had been previously been visited by reams of vegan Lonely Planet toting backpackers and was pre-empting my disgust and toning down ‘rat’ to a rodent with a better reputation. I am myself, it should be added, whilst not vegan, highly guilty of travelling only with a well thumbed Lonely Planet wedged under my arm, and the kind of baggy trousers which my friends refer to as ‘asylum pants’. The second reason I think it was rat was that Lonely Planet said it was, and The Bible tends to be right on these things. So I bought a single specimim of the confused lady, for the bargain price of 20p (14 cents) and headed off to find a spot where I could decently photograph it before eating. This done I had a few little nibbles. Tasted like beef jerky. Quite nice, though I admit I didn’t finish it. 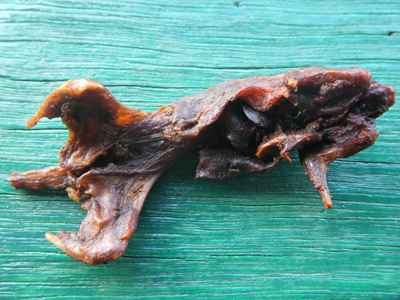 Stalls opposite the main post office in Battambang, Cambodia, sell ‘mouse’ (rat) for 14c each. Water lotus stem - looks like chicken. Isn't. Enjoyed this as a culmination of an amazing trip from Siam Reap (or thereabouts) to Battambang via waterways populated by boat people. This is an incredible place to visit – like another world really, with kids who swim more than they walk, and take boats rather than cars (OK, its Cambodia, mopeds). The whole river is built up with huts on stilts, but they’re right out into the water (river a mile wide in places) rather than on the coast-line. The result is loads of boat people, but also brilliantly entrepreneurial shop-boats – like house boats stuffed with everything from noodles to washing up powder – which motor about selling things to the general populace. I was crammed in with a mixture of backpackers and locals, plus one idiot with a giant camera who had a go at me for spending a ten minute portion of the four hour journey reading a book (Fear and Loathing in Las Vega – brilliant. It later came in handy as a backrest against the chicken wire during the hideous two hour truck ride over mud ruts in which we all had to get out at one point and right our toppled vehicle). Camera idiot: I’d have thought you would want to spend every second looking at the scenery. Me: Yes but I have more time to appreciate than you because I’m not judging how much other people are enjoying it. Camera idiot: Maybe you just don’t understand what you’re seeing. Also, don’t get me started on people who spend their whole time in beautiful settings snap snap snap. It feels to me like an acquisitive thing. I can’t just enjoy it now. I have to isolate it from its context and run back to my western nest with it to make it mine mine mine! But then, as you can see I’m no photographer, so I’m probably missing something. But I digress. We moored up at a slightly larger floating shack which turned out to be the river’s answer to a street food stall. The best thing was that rather than cook up chicken, the stir fry dish of choice was made with lotus stems, presumably pulled from the nearby waterways. Lotus actually have quite a meaty/mushroomy flavour, as well as having a kind of salty crunch all of their own. They were so tasty I tried to find them in other places, but alas I found no landlubbers to serve them. These are pretty tricky to find, on the basis that they don’t look like food, and unless you’re furnished with a picture you tend to assume when you see them on sale that they’re a floral decoration or similar. Lotus pods are seasonal, but in the hotter months and just when the rainy season starts you can find them sold all along the roadside in major cities. Phnom Penh you can find them on the south end of Norodom Boulevard, which runs near the river north to south. Second problem is knowing how to eat them. You have to dig out the acorn-like seeds from the flesh of the pod with your fingers and crunch on them. They are fresh tasting and nice, like somewhere between a nut and a vegetable. Pods are alarmingly green, and when the seeds come free and start to rattle around these are the ones you shouldn’t eat as they dry your mouth out and taste quite bitter. Instead go for the green seeds still lodged firmly in the pod. 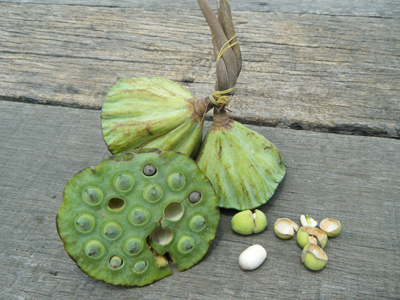 Lotus pods are found along major roadways in city when in season, and are also sometimes sold in posh local restaurants by roaming salespeople (read, small children). 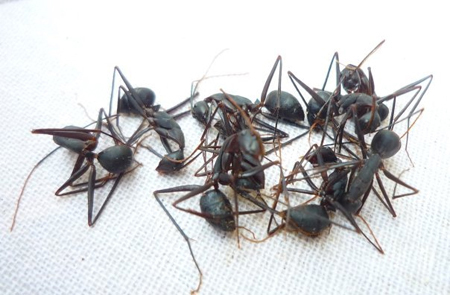 I bought these in a restaurant listed in Lonely Planet the other side of the river in local Cambodian eatery land. So it turns out that ‘happy’ is a euphemism in this part of the world referring to a food source which has been augmented (made ‘happy’) by cannabis. I can’t claim to have been unaware of the fact when I bought the pizza. In fact my friend Al confirmed that the pizza would indeed be of the ‘happy’ variety before the order was sent to the kitchen. The laws on cannabis as slightly hazy in Cambodia. You’re allowed to grow it for your own personal consumption and you’re also allowed to supply it to members of your immediate family – “girlfriend also ok” confirmed my Cambodian tuk tuk driver in a conversation on the subject. But selling it elsewhere is not on. 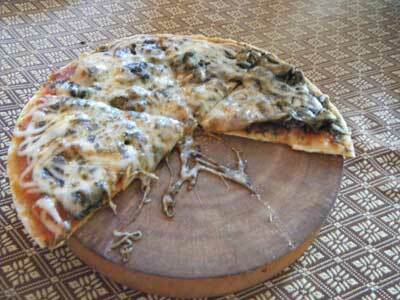 So is technically illegal to cover a pizza in The Herb and trade it for profit. But the police apparently turn a blind eye except for the occasional raids. Pizza arrives seemingly covered in happy herbs. Me and Al have a tentative slice each. I scrape off the chunkier pieces of foliage. Call me a wuss, but you never know how strong hash is until a few hours later if you eat it. I was once stoned for three straight days after eating a hash brownie at a late night party. I was so bored by the third day. 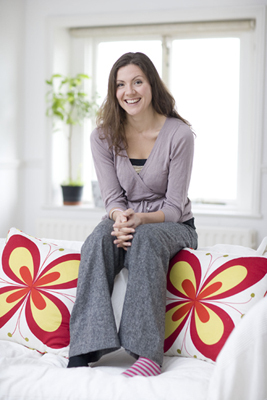 I hadn’t been stoned for ages, and I’d forgotten that interim period of am I stoned? Aren’t I? Things seem difficult to remember. As my friend Rob pointed out, this probably means you are stoned. Sadly things went downhill from here as I developed a cracking headache, so here my intrepid reporting ends. I was really keen on going out into the town and getting a fish foot massage whilst under the influence, but my pounding head though otherwise. And as it turned out, when we went the next day for fish foot massage it was not the kind of thing you’d want to do stoned. 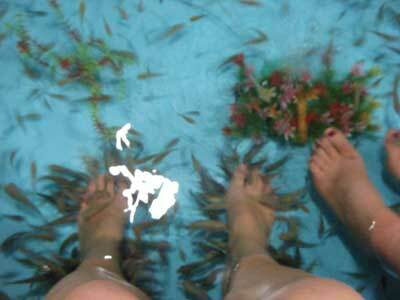 The fish have hoary little mouths and go to work on all of you feet – even the soft bits. Really very disconcerting and I’d have pitied the owner to have me, stoned, yanking my feet from the water and shrieking. As a moral aside to this story, we packed up the remaining pizza to take back to where we were staying. Then flew back the Malaysia a day later to hear the pilot announce as we landed “to remind passengers that smuggling drugs in Malaysia carries a mandatory sentence of death”. Cue me in an angst of paranoia wondering if we’d accidentally packed the pizza with us…. Note to travellers everywhere. Don’t do drugs. I was hoping for some grubby backstreet stall, manned by mysterious one-eyed snake vendor. Possibly reminiscent of that scene from Gremlins when he buys the cute but deadly little mogwai. Alas it was not to be. ‘BARBECUE SNAKE’ said the sign, in big English letters, on the most European of bar-lined streets in the whole of Cambodia. But that doesn’t mean it’s still not an experience – right? 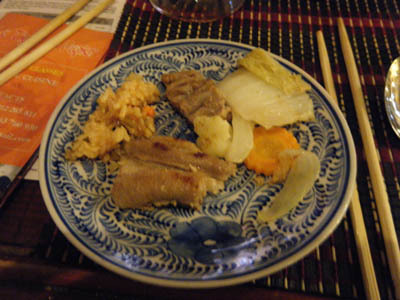 In fact the restaurant in question did a lot of unusual barbecued things, but snake was the most out there. It came all pink and naked looking in big chunks, alongside a hefty barbecue grill. You turn the grill on, wipe a bit of oil around and on goes the snake. After a mere few minutes its assumed a rather unappetising grey colour, but it smells good at least. You can find the barbecued snake restaurant on Pub Street in Siam Reap – south side of the street.